Living your life in way that you feel is right takes guts. A lot of people are afraid of really living their life “their way”. However, sometimes a 1% shift in thinking or actions is all you need to really “live your truth”. So, what are some of these 1% things? I see them as follows…. You must be committed to working hard and smart on the things that are holding you back. This is why I love the martial arts, as it builds a ‘spirit of commitment’. If you can achieve goals in the dojo, you can achieve goals in every other part of your life. I see students working hard to achieve their goals, irrespective of whether they are tired, scared or afraid of failure. The students are always taking baby steps to ensure that they achieve their ultimate goals, whether it be a Black Belt or whatever. However, are you working just as hard to achieve the other things that are important to you? If not, it is time to get to work on yourself and start living your truth. I was reading an interesting article over the weekend on people who have been really successful at social media. The one common link is that they let their uniqueness shine through. This means you must be an open book with the good stuff, the so-so stuff and the bad stuff. I know what my weaknesses are. I am a really shy and introverted person. It is weird. I can teach a martial arts class with 1,000 people in it and feel completely at home. But I can get one-on-one with people and feel really uncomfortable. I also do not like conflict (emotional, not physical), so I find ways of removing myself from the situation quickly. This can be sometimes be off-putting to the other person, who may think I am rude or arrogant. I am not meaning to be rude….I just do not like dealing with those situations. My avoidance of these social situations has really hurt over time. On the flipside, I am living a life that I have purposely tried to build over the years. I have a vocation as martial arts instructor and a career as a financial adviser. I have a great and understanding wife. I have the best family and friends anybody can ask for. I am healthy and can do the things I want to. I should be proud of living my “life by design”. I always ask myself why I build a wall around myself due to shyness, when I have some good qualities to share with the world. I know the answer, and it is because I am genuinely afraid to confront these weaknesses. I also know the solution can be simply smiling, asking people how their day was, and saying “please” and “thank you” more often. The weakness can then be overcome and the real me can shine through. Time to get to work on that weakness. What are areas that you feel you need to work on to let the world see the real you? This has only been a recent emotion to dawn on me. I was, and probably still are, worried about what other people think of me. That can be paralysing when those emotions get the better of you. 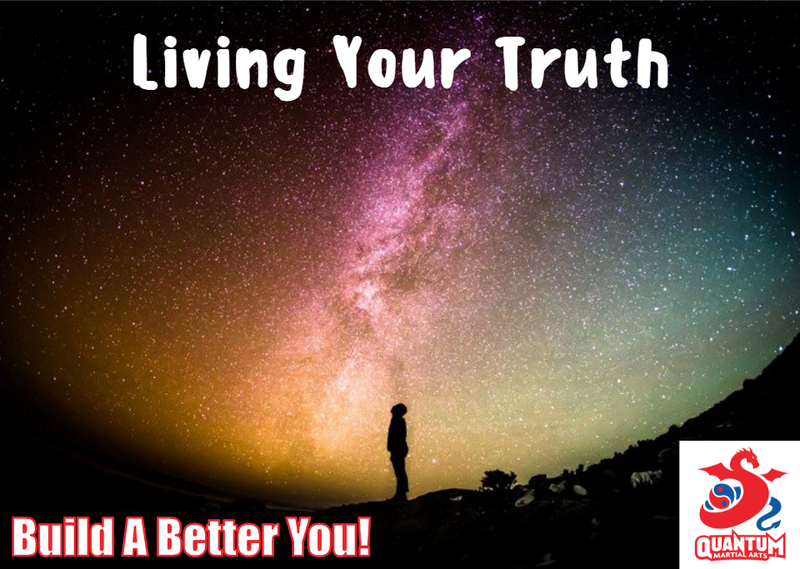 It really stops you “living your truth”. Happiness is an emotion that must come from you, rather than others. It is OK to not be perfect. It is OK to not achieve absolutely everything in life. It is OK if not everybody in life likes you. It is OK to just exist and “go with the flow”. It is OK to live your truth. You only have the power to control you. With this power, choose to be happy. Choose to look on the bright side of life. Choose to believe that you are doing really well and living a life worth living. You will be surprised at how your view of the world changes and everything will seem so positive. I am a really goal-oriented person. My goals are always “me vs me” rather than “me vs the world”. But it used to get me really down if I could not achieve my goals. I now know that, to be happy, I do not always need more. I have everything I want, as I am living my “life by design”. That it what makes me happy (irrespective of what others may think). If you want to be truly happy, do not dwell in the past, do not worry about the future, but focus on living fully in the present moment. This is easier said than done. I have not met anybody who is not a worry-wart over something or other. However, no amount of guilt can change the past, and no amount of worrying can change the future. If you really want to live your truth, it can only be done in the “here and now”. Each and every one of us have the power to change our own lives. It comes down to your daily choices. These choices must be made based on your truth, rather than what is important to other people. You must live your truth and not somebody else’s. The world has enough sheep, but too little people living a unique life. It is also important to note that everybody is who they are. It is nigh impossible to change your initial thoughts on situations. I do not want you to change your thoughts, as this is part of your uniqueness. But you do not have to keep feeding your initial thoughts by believing them. Instead, choose your reaction to these thoughts. Your reaction to situations is how you live your truth, rather than simply believing the first thing that pops into your mind. Living your truth takes real courage. You may, and likely will, fail a few times. But the journey of a million miles always starts with the first step. You cannot start living your ideal life if you do not take positive action towards it…now! If I get asked to do a silly task like predict next week’s weather, I do not care if I get it wrong, because it is not important to me. However, when you want to live your truth, these are things that are central to your core emotional being. You really care about these matters. Therefore, it is natural to be afraid. It is natural to doubt yourself from time to time. However, you are going to feel doubt and fear whether you are standing still or moving forward. So, why not move forward? You at least have a chance at succeeding this way. This applies with your martial arts, family, career, or whatever. If it is really, really important to you, you owe it to yourself to keep moving forward to live your truth. For this week, work out what is really important to you. Then, take one positive step towards your truth. As martial arts is a canvas for life, why don’t you also step foot in the dojo this week? This is one measurable action that can be used as inspiration towards achieving the other things that are important to you.